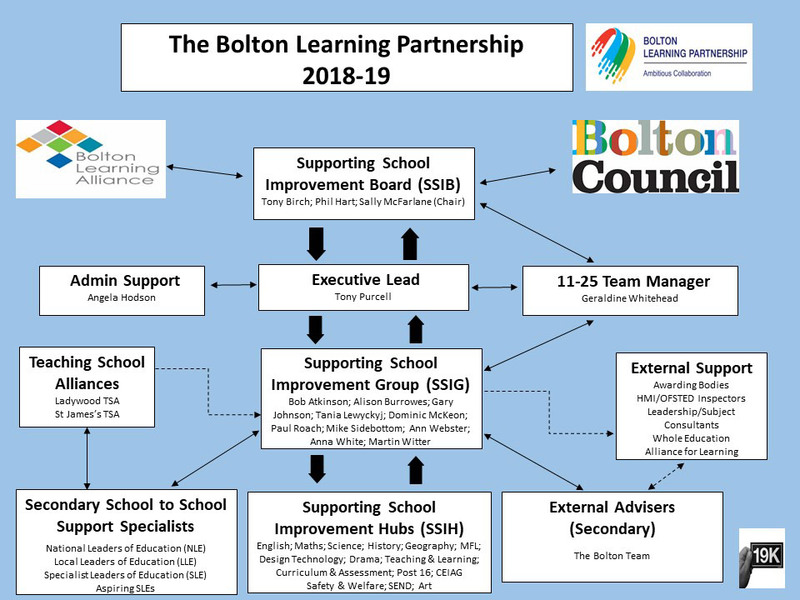 Our partnership is led by a Supporting School Improvement Board (SSIB) with representation from Bolton Learning Alliance; Bolton Council and the network of Teaching School Alliances in Bolton. Together they share strategic responsibility for the direction of the partnership. The Supporting School Improvement Group (SSIG), with representation from Bolton Secondary Head Teachers and Bolton Council are responsible for developing, reviewing and quality assuring the activity of the partnership. Together, we work with a wide range of external specialists including Whole Education, HMI/Ofsted Inspectors; educational consultants and the awarding bodies to support school improvement. Practitioners from within schools share best leadership and pedagogical practice through the forum of School Improvement Hubs to raise the attainment and progress of all students, at all levels and from all backgrounds.